Do you have any of my knit pants patterns: Basic Knit Leggings, Ruffle Leggings or Everyday Ruffle Pants?? 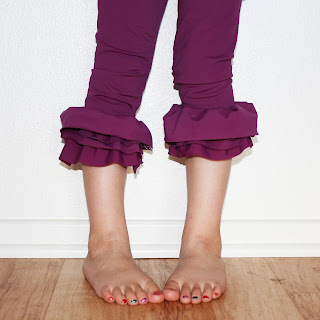 How about the Essential Pants, the Mega Ruffle Pants, the Flounce Ruffle Pants or even the Skinny Minnie Pants ?? They all feature an elastic waist ... have you ever wished you could do a yoga waist instead?! pssst ... the instructions for adding the Extreme Ruffles (shown above) to the leggings patterns can be found HERE. Well ... you ladies have twisted me arm ... but instead of creating and selling new patterns I've decided to write up a quick tutorial on modifying the existing patterns ... and passing along the savings to you !! You're welcome. 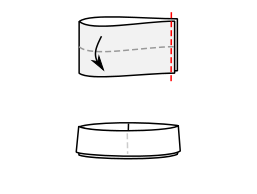 For the Everyday Ruffle Pants or the Leggings:: Draw a new line (shown in RED) 1" below the original cutting line for whatever size you are planning on sewing. For the Essential Pants, Mega Ruffle Pants, Flounce Ruffle Pants or Skinny Minnie Pants:: Draw a new line (shown in RED) 1 1/2" below the original cutting line for whatever size you are planning on sewing. Cut a strip that is 4 1/2" wide for a regular knit yoga waistband ... or 8 1/2" for a knit fold-over yoga waistband ... and then cut the length of the yoga band use the cutting measurements included in the patterns for the elastic. (above) FOLD the yoga waistband in half lengthwise. 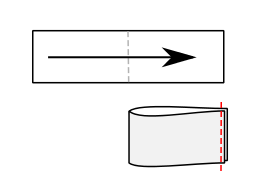 Align the short sides, RIGHT sides together. STITCH waistband into a loop using a 3/8" seam allowance. 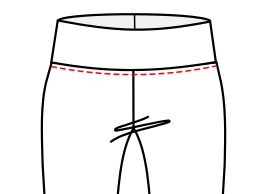 (above) FOLD yoga waistband in half, aligning the raw edges, WRONG sides together. 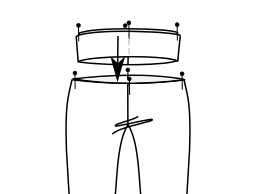 (above) MARK yoga waistband and the waist of your Leggings or Everyday Ruffle Pants into quarters. 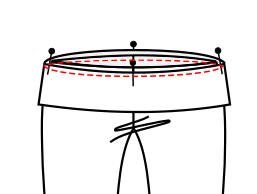 With the pants RIGHT side out, slip the pants inside the yoga waistband, RIGHT sides together, aligning the top edges and matching quarter marks and pin into place. (above) STITCH yoga waistband into place along the waist of the pants using a 3/8" seam allowance. You'll need to stretch the waistband so it matches the length of the waist opening, but don't over stretch !! 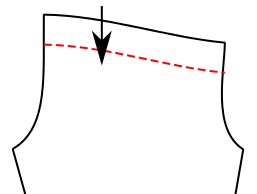 Backstitch to reinforce seam. Start stitching at center back seam of the waistband. 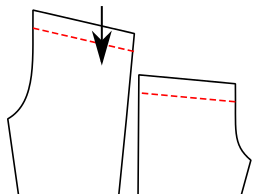 A serger's overlock stitch or a zigzag stitch is recommended for optimal stretchiness.